Directed by Alison McAlpine. 2017. USA. 78 min. Indiewire calls Cielo an “awe-inspiring documentary.” Director Alison McAlpine goes to Chile’s Atacama Desert, one of the best places on the planet to explore the night sky, and creates a sublime film that drifts between science and spirituality, the arid land, desert shores, and lush galaxies. 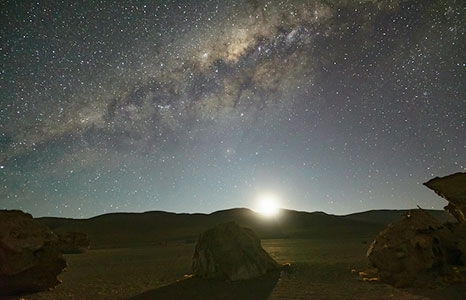 Planet hunters in the Atacama's astronomical observatories and the desert dwellers who work the land and sea share their evocative visions of the stars and planets, their mythic stories and existential queries with remarkable openness and a contagious sense of wonder. Don’t miss this cinematic reverie—a love poem to the night sky. The Honolulu Museum of Art is proud to participate in Science on Screen®, an initiative to offer creative pairings of current, classic, cult, and documentary films with introductions by notable figures from the world of science, technology, and medicine. This is an initiative of the Coolidge Corner Theatre, with major support from the Alfred P. Sloan Foundation.